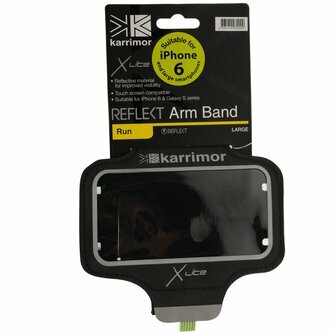 The Karrimor X Lite Reflect Arm Band is crafted with a lightweight construction that is reflective to improve visibility in poor light weather conditions. A hook and loop fastening is featured to allow for an adjustable , customised fit. It&apos;s transparent phone pocket is touch screen compatible and fits iPhone 6, 7 and Galaxy S series phone. This arm band is finished off with a discreet key pocket and Karrimor branding. Now features a cable tidy for earphone wires.